At Fourstones Paper Mill, we understand that sometimes simplicity is the best option. Whilst developing the new Sapphire Label, we set out from the beginning to provide a simple, bright and modern design. It is easy to over engineer labelling and packaging. The result of this can be very negative with consumers being too distracted and missing key information such as size and quantity. Here at Fourstones we are conscious that many end users want to clearly see the size of the paper products they purchase, such as the length of centrefeed and paper width of couch rolls. Being a proud member of CHSA (Cleaning & Hygiene Suppliers Association). When we put 150 meters on our label, our customers receive 150 meters. We wanted to make sure your customers see this information clearly so that they can make an informed choice with a product that is highly accredited. An alternative to labels are printed shrink wrap packaging. This option presented us with two options. Firstly, putting a logo or design on all of the packaging and secondly, creating a design that fits each products pack perfectly. Our understanding was that the prior would (as said previously) look over engineered and distract customers from the sizing and product. The second option for printed packaging would lead to higher costs and less efficient production, this is unnecessary cost for our existing products that we refuse to pass on to our customers. Overall we chose to keep the polythene that wraps our products clear, reducing cost to customers, making information clearer and most importantly, it allows your customer to see the product. By using clear polythene we do not hide defects in our products. Instead we simply provide a high standard product using strict quality control procedures to assure each roll looks perfect. The clear polythene on all our products such as mini jumbo toilet rolls allows your customers to once more make an informed choice on the products they choose, resulting in a better purchase experience. With this understanding we set ourselves a simple brief. Whilst designing our label at Fourstones, we looked at the information that has to be displayed on a label. We then deconstructed this information and highlighted the priority of the information for customers. From this we selected the most variable product specifications as priorities. Knowing that these specifications are important for end users to identify the product, we chose to display them clearly, spaced out and with their own icons. This allows consumers to glance at the different products and know what they are purchasing/using. Information such as emboss, colour, product name and code were added in clearly legible font above allowing customers to identify the product at a distance. We also added colour to the label in keeping with our website, making it recognisable as a reliable brand. To emphasise this we added the CHSA logo to the bottom right hand side with our member number. This means that all products can be traced back to our paper mill. Finally we added our company logo to the top right hand side. With the design completed we did not simply manufacture products under this label. We recognised that our customers would have opinions and we respect this. We tasked our business development managers to talk to our customers and receive feedback. Overall the response was overwhelming. However, there was one element that was not popular and this was the use of our logo. We listened to our customers and understood that going from an unbranded label to our company logo was concerning. Going back to the design process, we looked to add a recognisable element that does not directly tie the product to our company. The solution was to create a Sapphire brand, named after our Paper Mill in Scotland. We then sent copies of our design to the customers who initially had concerns, and overall it was very positive. 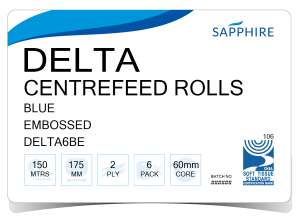 Fourstones now manufactures paper consumables products under the new Sapphire Label. A label that is Simple, Smart and Easy to Read. 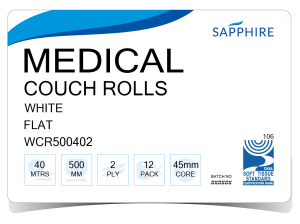 Allowing customers to know that when they purchase a paper consumables product under the name of Sapphire, they are receiving a quality driven and CHSA accredited product.